Wow it was a warm week here in the Netherlands. Really warm. We’ve had mild weather so far this summer, but this week the temperatures got pretty high. I am happy to have a job working from home as I just didn’t want to move. It was a good productive week. I just wish it was less warm, the warm weather always makes me a bit annoyed and I sleep less well. And Anna from her Herding Cats and Burnign Soup her annual Support the Troops Auction took place. It ran till July 3th, so it has ended now. I had donated a book blitz and it was fun to check the bids throughout the week and I am excited to organize a book blitz for the author who had the highest bid! Anna did a great job organizing the auction and I had fun participating. Monday Snickers had her surgery. I was a bit worried, but it went well. the vet did say it was a bit harder surgery this time as the tumor was bigger, and so was the price. He’s not sure if the tumor was a malicious or not, but he was pretty sure he got most of it removed, so let’s hope for the best. Most rat tumors aren’t malicious though, but it is a bit suspiscious when they get tumors almost on the same place and they grow as fast as this one did. Snickers had a burst of energy when she got home, probably due to the painkiller. After that we both took a nap. I bought lots of yummies for her to eat during her recovery and it seemed to work. She ate lots of avocado and baby food. She seemed to love the baby food and didn’t even noticed when I mixed in her painkillers. I bought some extra baby food and frozen mango this week. Smarties also seemed happy with the frozen food and baby food especially with the warm weather. The extra fluid and cool food is good for them. Remember how last week I did a post about netgalley on my blog. And one of the things I mentioned how it was a bit too easy to request books on netgalley and it required only one click? I am sure it’s enitrely coincidental, but last week when I was over on netgalley I hit that request button for a book and instead of sending my request another question appeared asking me what about the book appealed to me with 4 things you could click on: author, description, cover and I keep hearing about this book. Then you could clik on those that apply and had to hit the request button another time. Have you seen this extra question on netgalley already? What do you think of it? Beside that not much happened. 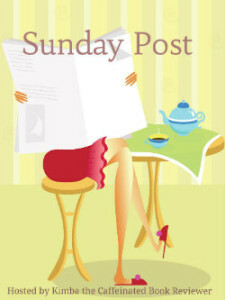 I got a bit blogging done, one Lola’s Kitchen posts drafted, I didn’t got much commenting done beside commenting back. I did read, but as both books I am reading are pretty long I still haven’t finished them. I am really enjoyed them though. I finished Love Games this week and started Led Astray on my ipad. I’ve been making my way through Vision as evening book. I am really enjoying both of them, but it’s been slow going as both are pretty long books. 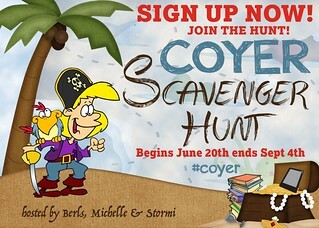 They will both count towards the scavenger hunt as well. Snickers spends most of ehr days on the couch where I set up a sputnik for her and a toilet and fleeche to give protection. 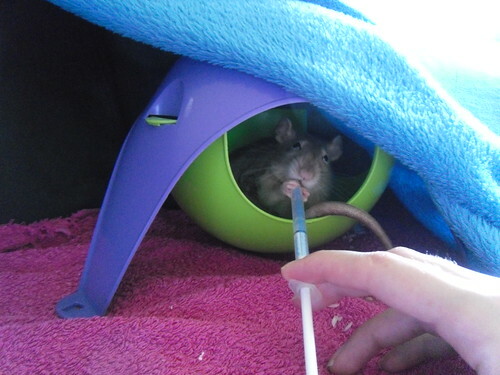 Here I am giving her some water with a syringe. – Lola’s Ramblings: What do you think of Series and Standalones? – Review Opportunity: The Cursed Ground by A. Roy King – sign-ups open till further notice – New! – Cover Reveal: The Coming of Arabella by Joanne Guidoccio – 14 July – New! – Cover Reveal: Tight Laced by Roxy Soulé – 16 July – New! – Trailer Reveal: The Silent Treatment by Melanie Surani – 21 July – New! I didn’t receive any new books this week. it looks like you have had a successful week on the blog, its always nice to get things accomplished!! Hope you have a wonderful sunday. Thanks! I did fall a bit behind with scheduling posts though, so I am hoping I can get a few more posts written this week. I haven’t been on Netgalley for a while so I haven’t seen this feature but it’s appearing on countless sites I visit. I get tired of these pop up screens demanding I answer questions before I can continue to what I want to do! It’s not really a pop up screen, it shows up below the request bottom and I think answering it is optional. I answered it because I don’t mind, but I also think you can hit request without clicking on any of them. Wow! What a busy week you had! Hope this one is just as fun! I saw that on NetGalley. I guess publishers are interested in why we choose certain books – how much the cover entices us vs the author etc… Will be interesting to see if it sticks around. Glad Snickers is on the improve. Yeah I am realy curious if it sticks around and I wonder if publishers get to hear the information or if it’s more for netgalley themselves. I hope Snickers fully recovers this week, she is always a bit grumpy when she had surgery and doesn’t want to eat and drink as much as normal, although I gues that’s understandable. I still worry about her. I have a netgalley account but I haven’t used it. So glad Snickers is doing well. Loved the ratty pictures. Avocado and baby foods are my rats favorite treats to eat too. I only learned about advocado and baby food when our rat Pita (Rip) was sick and she didn’t eat as much. Snickers and Smarties both love fruit and baby food. Snickers still doesn’t each as much as she should, but at least she eats a bit now. I saw that too! It made me wonder if there had been too many low reviews or no reviews for that publisher. But if it’s on all the books, that’s still pretty interesting. Maybe they’re trying to weed through and pick the requests that sound like they will be better fits for the books? Glad to hear Snickers is doing well after the surgery! Hope she’s back to her usual self soon and no more tumors. I am not sure if it’s on all the books. I only saw it on one. I didn’dare try it on other books, in case it didn’t happen and I would request them instead. I do wonder what their reasoning behind it is and whether they use it to judge the review requests or just to understand their audience better? I really hope this is the last tumor we’ve seen for a while, we now rats with tumors for three months in a row, first Smarties had a tumor and now Snickers two times in a row. I am hoping that at the end of this week Snickers is back to her normal self. Aw glad the herd babe did well! Always gets a mama nervous. That’s interesting about NG. I rarely request over there (usually I just accept invites or go through my pre-approved ones) but I may have to check it out and see what happens. That’s kinda nice they’re doing that and probably helpful to authors as well to know. I am hoping she will be able to get back into the cage with Smarties later this week. Snickers is still a bit grumpy and not eating as good as she should, but her wound looks good, so that’s a relief. Now hoping the tumor doesn’t return. I don’t get as many invited, so I usually just go to NG a few times a week and request when I see something interesting. I also think it’s nice they added the extra question. I am thinking it’s for all the books now, but as I onyl tried one, I am not 100% sure. It was fun being part of the auction and I am hoping I can join again next year. And I am looking forward to organizing the book blitz for the author who won :). Im glad that your rats are feeling better. They look like they have more energy. I’m in Florida and its extremely hot ATM. You got some nice books. I have seen the extra questions in Net Galley. I think it’s to help publishers find out what book bloggers like. Snickers is still a bit quiet and off, but I hope at the end of this week she’s back to her normal self. I think all books have the extra question now then? I think it will give them some nice insights on why we want to read a book, although I wonder if only netgalley sees what we answer or also the publisher? Hmms, that is it odd that you’re suddenly getting more questions when trying to request books. Can’t say that I’ve noticed a change but I didn’t request anything the last few weeks. Maybe their pulling an Amazon and switching things up so they get better feedback? Yeah I think it’s something like that. They porbably will use the feedback to get better insights in why we request a book. Other people commented they also saw the question, but I think it’s a recent change made somewhere last week. So you migth notice it next time. Yay! Glad for successful surgery. I noticed the change on Net Galley too. I guess they are trying to figure out what draws us to our books. Hope your temps grow mild soon. Thanks! I hope the rest of her recovery will go well too. I was thinking the same thing about the change on netgalley. Will be interesting to see if they keep it like that or remove it again. Glad Snickers is feeling better. Sounds like you made the recovery time as easy as possible for her. I had noticed the change on NetGalley. The timing is definitely funny! I’m curious as to why the changes were made not that they’re a problem. Have a great week! Being prepared with lots of yummies certainly helped, although she’s still not eating and drinking as much as I would like. I wodner what netgalley will do with the info they get from us answering those questions. I thought it was a fun coincidence as last week I talked about netgalley and hearign that other people also saw the question makes me think all books have this now. Glad Snickers is doing well. I did see that extra question on Netgalley, they are always upgrading something so I never know what is going to happen..lol. NO books..well you did a lot better than me..come over and find out…lol. I was actually surprised I got no new books this week. I actually got one from netgalley that I forgot to write down. It’s nice to have no new books for a week. I like the extra question so far, although I dow onder what they will do with the information they collect. I’m glad to hear Snickers’ surgery went well. 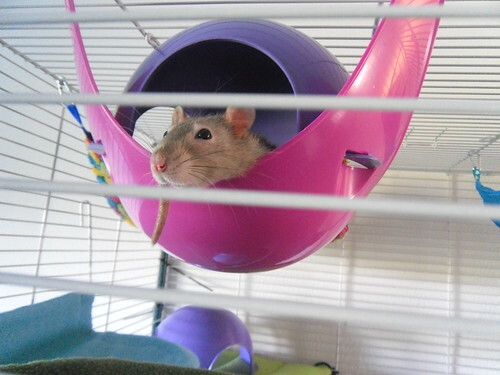 I’m not usually a fan of rats but your two are really cute, and that Sputnik thing is, too! We’ve heard about the European heat wave. I’m glad you’re doing all right. I feel for everyone who is dealing with that heat without air conditioning. It’s just so draining to be hot all the time. About that NetGalley question – I’ve seen it on some books I’ve requested, but not all of them. It may be a publisher option, something they can choose to use or not. Have a great week and I really hope things cool down for you all! Thanks! 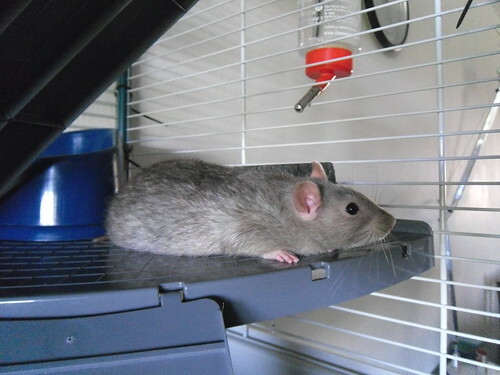 I never really considered rats as pets, until my boyfriend mentioned it and after doing some research on internet I quickly changed my opinion when I noticed how cute they are. They are rgeat pets to have. They love their Sputniks we have three of them in total. Snickers like having it on the couch while she recovers. That would make sense the publishers themselves can choose that option or not. I wonder if they also get to see the answers blogger give on the question when you send in a request? I would think the publishers can see the answers, otherwise why ask them? Though I don’t know if they see each individual’s answer along with the request, or just statistics on the answers week by week or something. Well I was thinking maybe it’s something that netgalley only sees, but I agree it would make mroe sense if the publishers sees it as well. Although whether they see it with the requests or just as general stats would be interesting to know. She did oull out one of her stitches tonight, but luckily it’s still closed. Giving her water or honey water with the syringe is the easiest way to get ehr to drink, although she’s pretty stubborn and refuses to drink sometimes. I don’t mind when it’s a bit warm, but not a fan of the too warm temperatures we have here at the moment. It’s too hot in my opinion. I hope Snickers is feeling better soon! When our dog was a puppy she ate part of a toy and had to have surgery to remove it. It cost a lot of money but it was so hard to see her in pain. Our pets are our family so we do whatever it takes to keep them healthy and happy. I haven’t requested anything new on Netgalley but I like that idea. I’m trying to catch up on my ARCs so this would have helped last year when I first started going on Netgalley. I wouldn’t have requested so many. It’s so hard to see them in pain. Surgeries can costs a lot, but it’s worth it if it means having them around longer. And that must have been so hard to see your dog in pain. I am also trying to get catched up with my netgalley ARC’s, but I can’t stay away for long. It is nice to have that extra question to prevent impulse requests. I do hope it’s for all books now, but don’t dare click on a random book, just to find out. Yayy, that’s fantastic news that Snickers is recovering well after her surgery! your babies look completely gorgeous. That’s good that Netgalley made it slightly less complicated to request books I guess. I am too scared to log into my account! Thanks :). It always takes a time for them to recover from a surgery like this, but so far she’s doing well. We even put her in the cage for a little while today and hopefully tomorrow she can be back in the cage full time again. I am sorry for making you hungry! It’s fun to share what I cooked for dinner. It’s getting a bit cooler here luckily, I can’t stand the heat. I really hope it wans’t a malicious tumor, rat tumors usually aren’t, but as this one grew pretty fast and came back slightly below the previous one. I hope you have great week as well! Glad Snickers is ok and on the mend. I noticed that on Netgalley too, I assume it is just some statistic thing for the publishers like the bit where you can click if you like a cover too. I requested a few more books this week and all had the question, so I think it’s like the voting if you like the cover or not. Would be interesting to know what the publishers do with the information.